In the epic film 300, the out-numbered and over-matched Spartan warriors overcame near-impossible odds just to reach the battle of Thermopylae and take on the mighty King Xerxes and his army of over 100,000 Persian soldiers. Is the story of the 2009 NCAA Tornament similar? Well, these Spartans weren't the heaviest of underdogs but you could make a case that they were losing many of their battles before surviving. USC. Kansas. Louisville. Connecticut. Now how can they defeat mighty North Carolina - the 2009 basketball equivalent to King Xerxes' army? >These Spartans are not out-numbered. They played 11 players effectively in their Final Four upset of UConn and got 30 points and 14 rebounds from the bench. The Tar Heels are explosive, but not deep. >Ty Lawson, meet Travis Walton. Lawson has had his way all tournament long, but he hasn't faced teams known for great defense in Gonzaga, Oklahoma, or Villanova. Walton is the Big Ten Defensive Player of the Year and he will make sure at the very least it isn't Lawson carrying UNC to a title, at least in this game. >In North Carolina's win over Villanova, everyone focused on Villanova's dreadful night from 3-Point range. It overshadowed the Tar Heels' poor night at the foul line: 22-37, 59% - not a good sign in a close championship game. Does anyone remember Memphis? 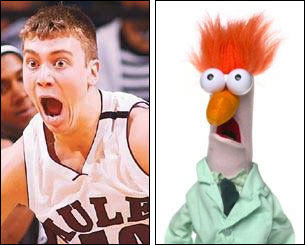 >Tyler Hansbrough looks like Beeker from The Muppet Show. I searched for "Beeker" images online, and someone had already remarked of that resemblance. It just illuminates that not all great ideas are original ones. noun - a person of great courage and self-discipline. adjective - marked by simplicity, frugality, or avoidance of luxury and comfort. Both fit Tom Izzo's blue-collar Spartan team...tonight in green.